The USMC’s Marine Expeditionary Rifle Squad (MERS) programme has been the source of considerable innovation and thinking on soldier modernisation over the years, designed to provide improved capability to the Marine Squad as a System, with the current focus, being on providing that improved capability for forces in Afghanistan. One regular feature of the MERS team’s schedule are surveys, undertaken with Marine battalions either post deployment or midway through their tour. These surveys are designed to find out, quite simply, details of what works and what doesn’t and what Marines really need. Every survey from each battalion is then collated to provide a larger perspective to inform future decisions. The surveys are both anonymous and well attended; 50 Marines from a battalion’s Golf Company recent attended one such survey. There were no Staff NCOs or officers in the room. Richter said, “Everything is non attributable. Individuals are known as Corporal SAW Gunner or Sergeant Fire Team Leader. You can say anything you want and you can talk like a sailor to me and I will understand what you are saying.” Staff NCOs and officers are surveyed separately as are the battalion surgeons and Corpsmen. Typically, surveys are done at company level but this approach isn’t rigid, with survey teams having the latitude to reorganise the structure if necessary, a recent survey breaking the company down to the independent surveys for each platoon. The questionnaires are formed by the MERS team working with the battalion S-3 to outline the primary missions being undertaken which include engagement patrols, ambush patrols, checkpoints and combat patrols. The participants were then asked to state in percentages the time spent on each mission type during their deployment. Groups worked together to establish a consensus answer. Another aspect would be to subdivide each mission between day and night, which provided a context for other aspects of the survey such as battery use. Other elements of the survey addressed the degree of participation with the Afghan National Army and Afghan National Police, the share between mounted and dismounted missions and the characterization of threats between IEDs, small arms and indirect fire. In the case of the PVS-17C Miniature Night Sight issued to each squad, 12 percent rated it completely unacceptable. Further questioning found that this was down to interference issues with their helmet. Load carriage is always an issue and the MERS teams want to understand that issue better. In one survey, 76 percent of the company said they carried extra stuff because of resupply concerns. They were often undertaking operations as much as 50-60Km away from their base with supply from the road having to run an IED gauntlet. The load carriage questionnaires cover ten pages and addressed thermal issues, fatigue, physical demands, length of foot patrols, power and mobility issues, injuries suffered and recommendations from the Marines on how to address the issues. Marines were asked what three items were the most useful. Richter said that the number one piece of equipment was the PRC-153 radio, of which there are 704 in an infantry battalion. Successive surveys have shown that ranges of 10-12km are being achieved in Afghanistan with Marines in Iraq finding the range was 7km. Richter said that the requirement for the radio was 4km. In terms of what doesn’t work there are a lot of answers, many of which illustrate the need to follow up questions to understand context. In one example, feedback found problems with the PVS-14 Night Vision Goggles. Following up, the MERS team found that it was not the equipment itself that was the problem but the state of equipment. It had undergone several deployments as it was becoming worn, indicating that new equipment rather than a new design was needed. With the Marines deploying on seven month tours, with a nine to ten month interval, including leave, to conclude training on new equipment before redeployment. A recent survey found that the battalion in question was expecting over 350 new joins, straight out of the School of Infantry, posing further training challenges. Richter sees Training as the sixth ‘-ility’. He commented said that the MERS team has found that training support is available but that battalions don’t always realise it is available. Offering a MERS insight into improving the training process, he believes that Marines become saturated after about 45 minutes of instruction and that rather than supply them simply with information, this must be accompanied by practical application. He commented, “If he can touch it, hit, he will learn and understand.” Beyond the training room, Richter also calls for quick reference guides that Marines can take with them to their deployment to refresh their knowledge. MERS has cast far and wide to find answers to the problems of weight on the soldier. One example is the Design Light initiative, part funded by the DoD’s Office of Technology Transition. The team used was a twenty strong team of subject matter experts (SME) from fields such as material science. A common theme was that they were not from the producers of the equipment being examined and thus had no stake in the outcome. They were presented with the equipment and given handouts on how and why it is used and where possible, given access to the Corps’ engineering leads in the area. This took place over a week in November and with over 150 items being examined leading to over 200 recommendations. Richter gave two examples of this process; reducing weight on the camera bag and cold weather gear by 15 percent and reducing the weight of tents and power management systems where the SME’s felt weight reductions of 35 percent were possible. Other work by MERS includes the Load Effects Assessment programme, designed to put, “a metric to mobility.” Data for this was delivered by Raytheon in December. The company is also the lead on the Marines’ Gruntworks facility which Richter said is always under improvement with one recent project being physiological status monitoring. 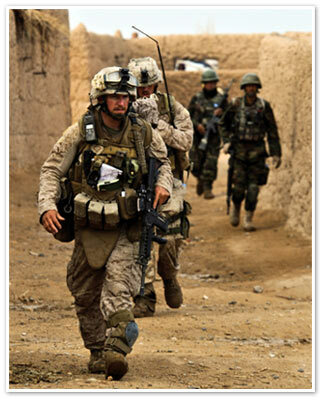 The Marines are noted for undertaking complex measurement and understanding of thermal issues, undertaking field trials in Iraq in 2008, with MERS due to repeat this experimentation in Afghanistan this year. Monitoring of the same issues are included in the battalion survey, with the MERS team quizzing battalion surgeons and corpsmen on the subject. Differences appeared between units on heat casulaties related to when units deployed with those deploying prior to the Afghan Summer and given time to acclimatise did not experience heat casualties while others that arrived during the Summer did have casualties.